When you launch Google Maps and plan a route, you’ll usually see a few different transportation options. Walking, driving, taking the bus, train or tube are all pretty standard, but look hard enough and you might see a few “secrets” in the mix too. We’ve been tipped off about the following Easter eggs in Google Maps, which should give you a good chuckle as you take a birds-eye view of the UK. If you find any more for our little list, be sure to let us know in the comments! This mythical beastie continues to draw people to the Scottish Highlands, despite the lack of any real substantial evidence that points to its existence. Until someone can prove (without a shadow of a doubt) that it doesn’t exist though, the mystery around this mysterious and long-surviving sea creature endures. 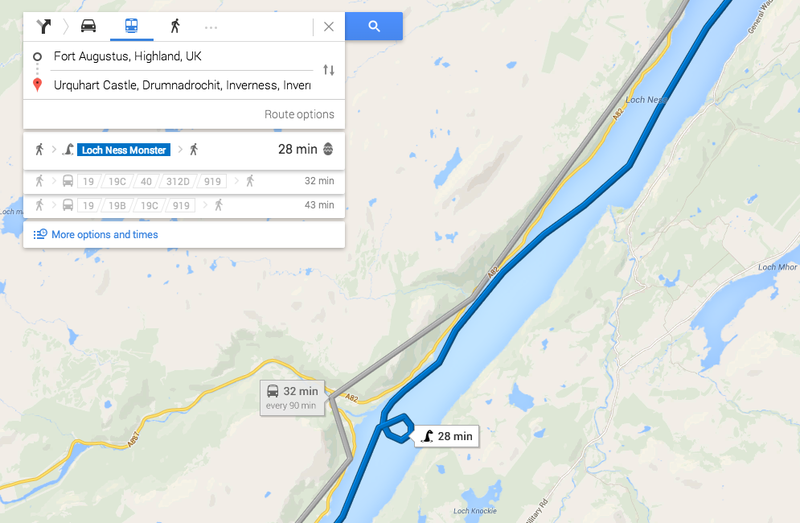 If you’re a fan of the Loch Ness Monster, you can see it as a mode of transport between Fort Augustus and Urquhart Castle in Google Maps. The company says it’ll take 28 minutes, which is a tad faster than the bus. 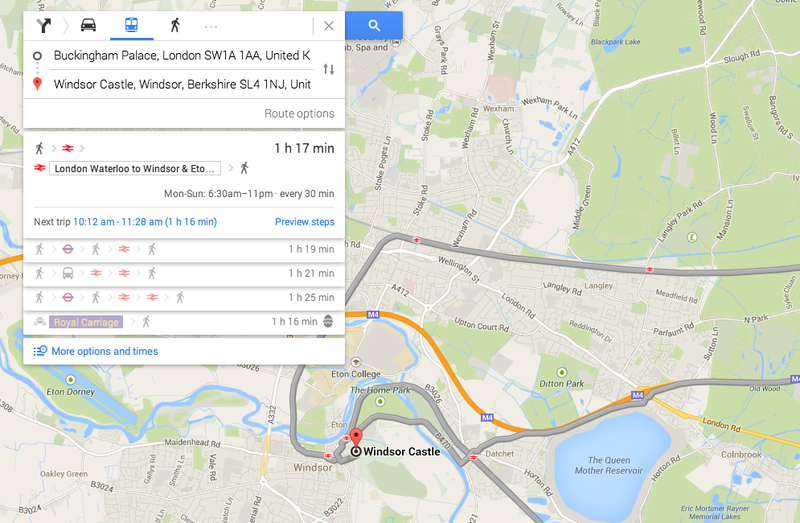 I’m not sure anyone has asked the Queen of England whether she uses Google Maps. Just in case, Google offers the Royal Carriage as a mode of transport when you ask for a route between Buckingham Palace and Windsor Castle. Both are iconic buildings for the Royal Family and the journey, according to Google, should take roughly an hour and 15 minutes to complete. If you’ve ever ventured to Oxford or Cambridge, you’ll know that punting – steering a flat-bottomed boat on a narrow or shallow river – is a defining characteristic of both cities. The laid-back form of public transport is especially popular with tourists in the summer, and students often use it as a way to earn some extra cash for the next semester. 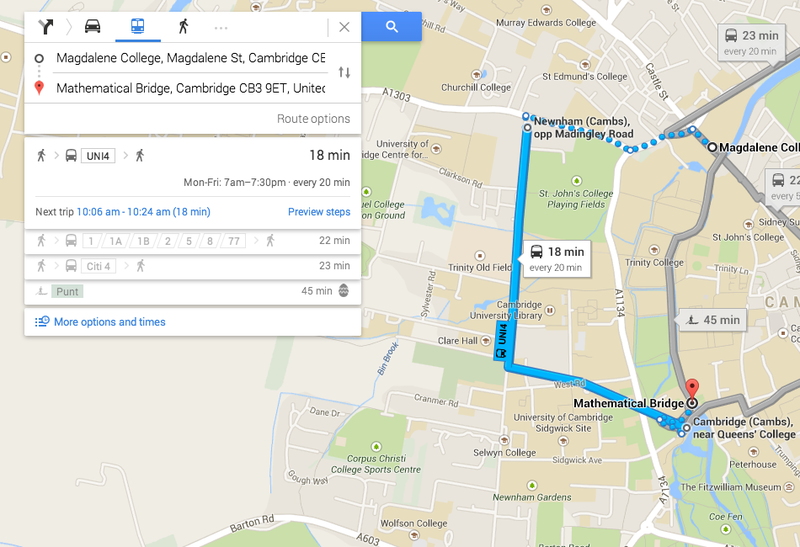 If you want travel between Magdalene College and Mathematical Bridge (Cambridge) or Magdalen College and Wolfson College (Oxford) by water, Google Maps has got you covered. Enter either of these two routes into its navigation service and voila, you’ll see “Punt” as a form of travel. 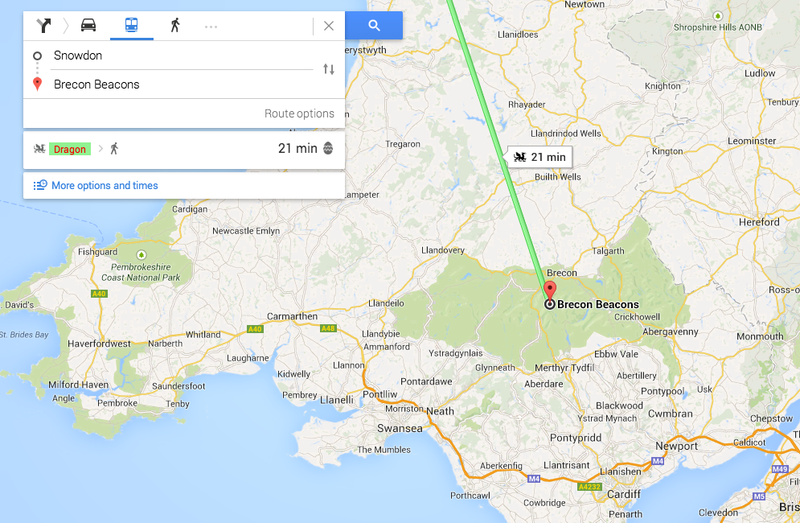 A quick recap regarding a Google Maps Easter egg we spotted earlier this week: if you request a route between Snowdon and the Brecon Beacons in Wales, Google will suggest a “dragon” as one of your transport options. It makes sense, given that a red dragon already adorns the Welsh flag – although I like to think it’s a sign Daenerys Targaryen will soon be gracing our world with the ferocious Drogon, Rhaegal and Viserion in tow. Editor’s Note: Have you spotted any others? Let us know in the comments!